Serene, peaceful, soothing, tranquil, restful and harmonious are just a few of the words that come to mind when we think of idyllic Manhattan Tower Apartment Hotel in Fort Lauderdale, Florida. If you are looking for a charming and peaceful oasis in the busy Fort Lauderdale Beach area, we can't think of a better place to stay. Yes, we love this place! "Many guests have commented on the spiritual nature of Manhattan Tower. There is a natural serenity in the gardens and to sit by the water and watch the boats go by has a calming effect that many experience. There is a joy in serenity that many cannot identify but many may experience without knowing its source," said owner Russel Dion. Manhattan Tower has been called a mid-century, modern architectural masterpiece. Located on the east bank of the Intracoastal Waterway just a five minute walk from Fort Lauderdale Beach, the apartment hotel was designed and built in 1952 by the innovative architect, Charles McKirahan for General Motors executives as a corporate retreat for executives and their families. The signature Frigidaire logo was created with iron tubing, soars 50 feet into the air and surrounds a circular staircase. "It is exactly because it was so unique and historic that this property stood out above all others. The unique architectural character of the property is immediately evident to all passers-by but had a special meaning for us. The entry tower of iron tubing which also forms the support for the stairway to the second and third floors and continues for fifty feet into the air is striking in appearance and declares I am special. The architect, Charles McKirahan, who designed this marvelous example of Mid Century Modern architecture was well known in the area where many examples of his work may be found. Unfortunately, he died in a car accident in his 30s and so ended this force in architecture. In addition to the special nature of the architecture the deciding factor in purchasing the property was the private apartment on the third floor which stretches for eighty feet along the Intracoastal Waterway with floor to ceiling walls of glass looking on to the parade of boats. The prospect of living there was irresistible." One of the favorite and most peaceful sights for Manhattan Tower guests is the ever-present boat parade passing by the private balconies and expansive waterfront terrace. Fort Lauderdale is sometimes compared to Italy's Venice because of its canals, boats and yachts. From jet skis to water taxis to sailboats to mega yachts, you'll see them all sail by. There is something very relaxing about watching them all glide slowly past the hotel one after another. A guest from Ohio sat on his balcony watching the boats every morning and evening. He told us that he has returned to Manhattan Tower for three separate stays because it is "where tranquility reigns." What is truly amazing is that this tranquil property is just a five minute casual stroll from the tourist attractions of world famous Fort Lauderdale Beach. We have stayed in multiple properties amongst the busyness of the tourist area but Manhattan Tower is truly unique in its relaxing vibe and its quietness. Only three or four blocks from the noisy main beach strip, it is astonishing how quiet the Manhattan Tower property is. Whether you are in the mood for peace and quiet, a day at the beach or a night out on the town, this location is ideal. * Exceptional personalized service and great local knowledge. Manhattan Tower is also dog friendly. "We love animals. We do allow any size dog as long as they are always on a leash in the common areas and are will behaved. Unfortunately, we found too many people are allergic to cat dander and so cannot allow cats," Dion said. "Families will find that the location and amenities we provide will make their stay particularly enjoyable. To be able to barbecue on the waterfront deck and then to have dinner al fresco is an amazing surprise for them. To be able to have meals at home is a big savings for many families and older children have the independence to walk to the beach and all beach activities such as wind surfing. We have a family of an older mother and father with their five grown children and the many grandchildren who come and take five apartments. They are all together yet have their own space. Many meals are taken on the waterfront terrace," Dion told us. 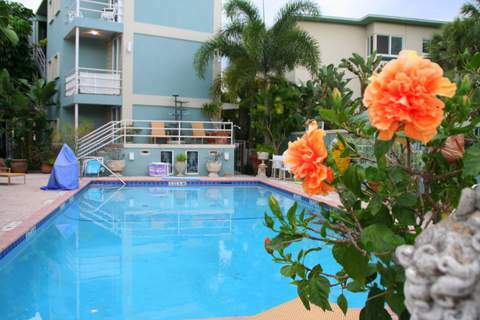 Manhattan Tower is truly a charming and peaceful oasis in the Fort Lauderdale Beach area. We highly recommend Manhattan Tower. Manhattan Tower is located at 701 Bayshore Drive, Fort Lauderdale, Florida, 33304 USA. You can reach them by phone at 954-564-1117.